Regenexx Advanced Stem Cell Support Formula is a supplement for joint health, based on ingredients that support stem cell function and, in particular, the processes taking place in the body for making new cartilage. According to the manufacturer’s website, a lot of research was employed for identifying the best compounds to promote this process. As you may well know, stem cells are human body cells that can evolve into any type of cells needed. In the case of this product, the role of the ingredients is to stimulate the conversion of some of these cells into new cartilage, so that your joints remain flexible and healthy. Let’s see what this supplement for joint health is all about. What Does Regenexx Advanced Stem Cell Support Formula Contain? We can easily see from the list of ingredients that Regenexx Advanced Stem Cell Support Formula contains many good ingredients for joint health, including the useful glucosamine sulfate. So, it can be a reliable product for promoting joint mobility. Since the formula comes in liquid form, you will have to take one ounce of daily (two tablespoons). The cap has exactly one ounce, and can be used for easy measuring. 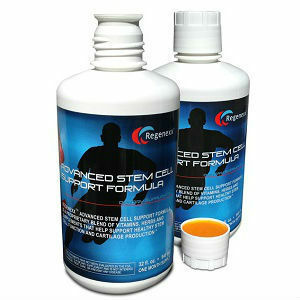 One bottle of Regenexx Advanced Stem Cell Support Formula contains 32 servings, so it lasts one month. The price per bottle is 97.99USD, which is kind of steep. Because it contains turmeric extract, the product may trigger colic bouts in patients with a gallbladder condition. Also, it contains shellfish and corn, so those with allergies must be cautious when taking this supplement. It is not clear whether a money back guarantee is offered or not. However, contacting the company is simple, via their online form, and other contact details are readily available. Also, it must be mentioned that the manufacturer is involved in studies for patients using this formula, and the results can be seen on their website. Regenexx Advanced Stem Cell Support Formula looks like a powerful blend, combining vitamins and herbs with well known allies for joint pains and discomfort. However, the price per bottle is rather high, and there is no clear money back guarantee offered. Mark Stevens	reviewed Regenexx	on February 14th	 and gave it a rating of 2.5.